I've never heard of anyone complaining about the WUC length though. I'm wondering where the feedback is coming from? Couldn't they just make a "tall" version like they do with other items? Well, whatever. I know. I'd rather they took an inch off the Inspires. Agreed... the claim of the extra inch being based on feedback seems highly dubious. I got the bumbleberry WUC in the mail today. Gorgeous color but dude!! I did not need an extra inch!! They're almost full length pants on me. @ Lake - good eye. Yeah, no cuffins no buy. I wonder if the price will go up with the extra length! My favorite Street to studio crops were $88 and when they turned it into "pants" by adding one inch to it, the price went up too! 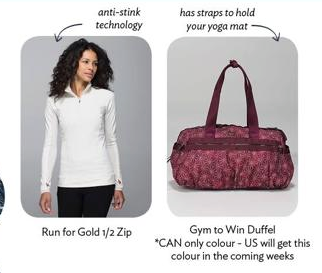 I don't see a reason to add the extra inch except to justify a price increase...damn it lululemon! So sad with the NLT! I think they got rid of it because so many discount brands rip it off. Still....you can't fake Lulu. I guess I need to buy a few more! Tried on the bumbleberry WUC in the Robson store today. It is so long that the bottom hits so low that it flares out. I am 5'1" but still. So sad that WUC is ruined for me! WUC is ruined for me also. I'm 5'4" and the old length was perfect. I know they offer complimentary hemming but a lot of people do not live anywhere near a store, so that leaves them out of luck. Have the WU's with a print always been $10.00 more than the solids or is this new in the last few weeks? Should we brace for a price increase across the board? Last week I asked an educator why the flowabunga print inspires were cheaper than the other prints in the inspire crops. Both being all luxtreme, she could not give me an answer, and that was an online educator! If they jack up the prices of there already pricy merchandise I think I will be parting ways with them! I can't swallow almost $100 for new running crops when I already have drawer full. I must say though that these new tweaks to designs are making it a lot easier for me to forgo purchases. So the purpose may well be a price hike, but the crops are too short for me - another 2 inches would've been preferred actually. I end up buying the full length pants (which cost more) and having them hemmed into me-length crops. I have provided feedback on this before but guessing I'm in the minority - at least based on comments here, but hope you all have good hemming experiences! Oh and I'm 5'8" but ALL leg!!! Wasn't there a rumor going around that LLM was trying to get a patent on the No Limits tank design? It's pretty strange to discontinue the top if that were true. Oh well, maybe they didn't get the patent after all, that's why. 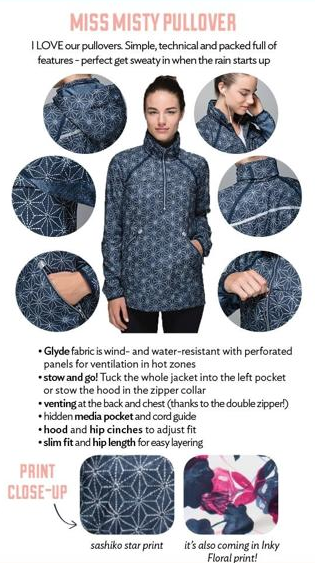 anyone know if Canada got the printed Saschico star Groove Wunder Unders? Can't find it on the site and am wondering if it sold out or was just never there. Why, why, why, must these half-zips always have that ugly high-contrast color-blocking in the underarms? I realize it's a different fabric there, but still - it looks unattractive, and it keeps me from wanting to wear these as casual pieces as well as workout pieces. 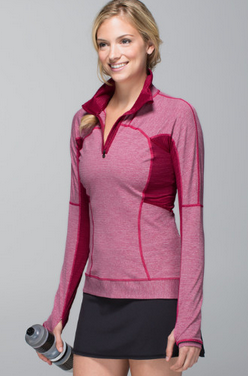 Please, lulu, make some of these comfy, otherwise well-designed half-zips WITHOUT color-blocking there! Off to post this at hey LLL also! Run for Gold half zip...I'll have to see this in person. Is it rulu? 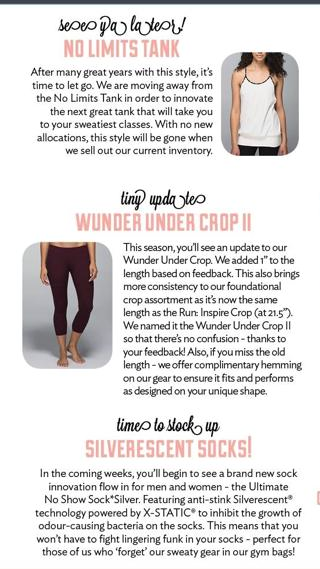 I too am skeptical that lengthening the WU crop is based on feedback bit 9:35, how are they ruined for you? Just get them hemmed. If you don't have a store nearby, I get your plight that seamstresses charge you money. And when people say hemming takes too long *eye roll* (First World problems). I would love to see some (solid) Bumble Berry or Jeweled Magenta shorts! I am also disappointed they are adding length to the WUC. I'm 5'7" and prefer the current length; also find Inspires too long. If I want a longer pant I'll buy full length! Guess Lulu is going to spend a bunch of money hemming my pants now. I am extremely meh about this week's Britt's picks. I use to have to have quite a few things get hemed, like WUP. Now with this NEW WUC, I got one more items that I will always need to get them hemed. Great job damn Lulu. Why they love to ruin great things from the past? Where did those stupid feedbacks come from? I'm also a little ticked about the WUC. I'm tall (5'8) and I still prefer the shorter length. My favorite run crops are always the shorter ones (pace crops, mod moves, etc.). Definitely seems like a weird "improvement" for them to make. Is the bumble berry WUC in US stores yet? LLA- question for you- if you check out the All sport Bra online in the magenta color - what shorts is the model wearing? Are those new? thanks! I don't like the length of the inspires. I don't understand why they are making the WUC the same. No Limits was one of my favorites. So flattering and great for hot yoga. Lululemon is really, actively trying to lose me as a customer. WUs were ruined for me when they switched from the diamond gusset. I don't really understand why they keep messing with something that clearly people already were happy with!! complimentary hemming does not work for me as i am not near a store. I'm also very short!! so inspires have always been too long for me. i have gravitated towards the shorter run crops but also wondered why, in all this time, why ll has not come out with petite and tall lengths on items?? i have seen the request for both items for years in website reviews so I'm not sure why they haven't accommodated?? short tops/jackets, too long pants lol. I guess I'm in the minority but I love that they are adding an inch to the wuc. I guess you can't please everyone. As for the no limit tank, I'm sort of excited to see what they come up with for a replacement. I like the tank, but the style has been around for so long that it was starting to look old to me. Anon at 4:40am. I'm not the person who said the WUC were ruined for her but I understand what she's saying. Hemming doesn't always solve everything. Just because you can hem them, doesn't mean it'll look the same. I wouldn't be surprised if they end up flaring out a little which is what happens if I try to hem WUP. They end up not being tight at the ankle. Before everyone works themselves in an unnecessary tizzy (as usual), I think they're just trying something out with the new length. You know, seeing how they sell? How else can they try things out? They're still coming out with colors in the original length. And if you like the bumble berry you can get them hemmed for free. I do love the length of the high times crops (I'm 5'7), maybe I'll love these too. Wow, all of this stuff is totally unappealing to me. Not remotely tempted by any of it. That run for gold half zip looks like something from old navy. Crossing fingers for a bumble berry CRB and all sport or energy bra. I also prefer the longer length of the WUC II and definitely the original length of the inspires. Not impressed with the new luxtreme inspires and how the material shortens up length and feels like a scuba suit! Totally with you Caitlin. I own 10 time of WUC than Inspires, and that most because the length of Inspires are 1.5" longer than what I want. Now, what do I do when they make this new WUC same like the Inspires' length, stop buying or start heming? Maybe start growing, then those long leg gals won't think they are minorities? I actually like the idea that wuc will be a bit longer. I am short and the shorter crops make my legs look even shorter. That's why I only have one pair so far. I think I will love them in the new length and will be bying more. Gave some investment history I was not familiar with. I could use help on Scuba II sizing. My first Scuba. I'm 5'6", 125 lbs, 34D. Does the Scuba (95% ctn/5% spandex) stretch out over time? Does it shrink at all in the wash? Any advise wld be greatly appreciated. I will try to post it again in hopes that it will get published this time around). I might be in the minority, but I love longer WUC length. Just like my ombré cotton ones- they are longer and nobody complained that they were longer. Sold out in seconds. So, got my black wrap today and found out that black is much more slimming than the white one. Keeping and loving it. Hope it doesn't shrink weirdly after a wash ( has been reported). Also got the bumble berry WUC- soft, opaque, and gorgeous color. Hope they make more tops in this color or tights with print ( herringbone? ), the BD WUP are see thru, not soft, and BD is of a brown shade. Not a fan, but to each their own or so they say....the black lab dress is actually much better than the cadet blue one- thicker and more forgiving. Perhaps it was an online return, but I am happily keeping it after cadet in two sizes didn't work for me. anonymous @ 2:55pm...I just got an athlete catalog in the mail too, and everything looks super nice, and trendy and fun. I'm ordering those same tights to see and a couple of their sweatshirt/long sleeve tops. We'll see!! the scuba size person again...on closer look, I see I was incorrect on fabric content. Fabric is 70% cotton/30% Poly - so it shld not shrink or grow appreciable. The side panels are 95% cotton/5% spandex. Those may shrink a bit, but will stretch out again with lycra. I think I answered my own question. Bottom line, if I want a snug fit (can easily do bra/tank/swiftly l/s), keep the 6. If a want a slightly slouchier look or more room to layer, keep the 8. I'd love to hear others' perspectives on scuba fit. I don't mind the longer crop length, but the jury's not out yet as I still need to try them on. I like where the inspires hit, and the runday's even more, so I'll probably like the new WUC length. As for the no limits, it is a classic Lulu style, but I'm interested to see what's next. It never really worked for me. I agree with 3:23p. I'm 5'3" and the original WUC makes my legs look shorter & stumpier than they are. But the WUC II length looks awesome on me cuz it slims my legs. It also doesn't ride up on my calf when I do the splits, lunges, squats, etc.in my vinyasa practice. I agree with Insightful Athlete's comment - I think a big reason the NLT is being discontinued is because so many discount knockoffs. I've never been a fan of the style, so no sweat off my back. As for the extra inch on the WUC, I'm all for it. I love the inspire crops and their length, and actually looking to sell off my RFYL crops and other shorter crops because I just don't wear them as much. And I'm only 5'5"! @ anon 8:05 am - I think that is a new style. @ anon 11:18 am - It baffles me why they don't offer petite items in items. I have a couple of petite friends who like lululemon but buy at Athleta because of their petites. My sister, who really likes lulu, is slightly under 5' tall so what she can buy at lululemon is limited. @ anon 5:01 pm - Scubas may relax a little bit with wear but will tighten back up when you wash it. I haven't had one shrink on me at all. It depends on if you want room to layer or not. When I go to my bigger size I have extra room in the upper chest/armpit area which I kind of hate. @ anon 8:12 pm - but so many other designs have been stolen from LLL, too. It's probably they weren't selling that well so are giving them a rest for a couple of years. I'm a NLT so just trying to buy more now that they are being discontinued. I think it's odd that they are stopping the NLT, even if temporarily. Just don't make so many of them! Scarcity model is their whole thing anyway. It's by far the prettiest loose tank they have offered. All those other versions, ugh. Not offering Petite sizing - could be such a win for them but they continue to not offer and not innovate in this way. I love that they are lengthening the WUC. I do enjoy crops but I felt that the WUC hit my calf at an awkward point cutting me off, making me not only look shorter but make my calves look wider. Thank god they are lengthening them. This also means they will be easier to pair with boots in the winter, which was one of my main reasons for always buying the pants.